The timeless wisdom of this classic Taoist text can become a companion on your own spiritual journey.The Chuang-tzu is the second major text of the Taoist tradition. It was compiled in the third century BCE and follows the lead of the best-known and oldest of all Taoist texts, the Tao-te-ching (Book of the Tao and Its Potency). Representing the philosophy of its main author, Chuang Chou, along with several other early Taoist strands, the text has inspired spiritual seekers for over two thousand years.Using parable, anecdote, allegory and paradox, the Chuang-tzu presents the central message of what was to become the Taoist school: a reverence for the Tao—the "Way" of the natural world—and the belief that you are not truly virtuous until you are free from the burden of circumstance, personal attachments, tradition and the desire to reform the world. In this special SkyLight Illuminations edition, leading Taoist scholar Livia Kohn, PhD, provides a fresh, modern translation of key selections from this timeless text to open up classic Taoist beliefs and practices. 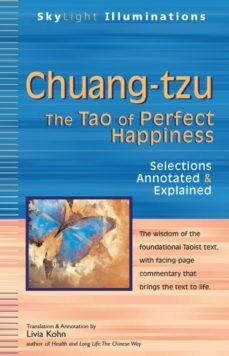 She provides insightful, accessible commentary that highlights the Chuang-tzus call to reject artificially imposed boundaries and distinctions, and illustrates how you can live a more balanced, authentic and joyful life—at ease in perfect happiness—by following Taoist principles.